1) Who makes this program possible? A: PHEHA is made up of neighbors who volunteer. Our volunteers dedicate countless hours to maintaining this community organization. Our desire is to increase neighborhood support and participation for a safer and friendlier Preston Hollow East. Please consider volunteering your time and contributing to our annual fundraising effort. A: Yes, Code of Conduct for PHEHA Members: In Person, On The Website & Social Media Channels. Be Kind. Be Neighborly. PHEHA welcomes helpful conversations between neighbors. When discussions turn hurtful, everyone suffers. PHEHA prohibits posts, emails, replies and any other communication that discriminate against, attack, insult, shame, bully or belittle others. The PHEHA meetings, and website and social media channels are platforms that allows neighbors to work together to improve Preston Hollow East. Political campaigning and personal views on controversial subjects may offend neighbors. Please report those who are over-posting, campaigning, and ranting. * Any neighbor found to be in violation of these terms may have their PHEHA membership suspended immediately pending review of the facts by the PHEHA Board. Anyone in violation may be receive a 1 year suspension or even a lifetime ban depending on the severity of the findings. 3) I don't remember how to contact Patrol - where can I find the phone number and email for Patrol? A: PHEHA mails a letter and sends an email to all members when membership is activated that includes this information. In addition, active members can log into our website to view this information. Once logged into PHEHA.org click on the member's tab to find the patrol contact information. PHEHA also provides a cabinet sticker to members that can be added to the inside of a cabinet for ease of family use and reference. 4) When should we join? A: Members can join anytime. However we recommend you join during the annual fall membership drive so that you get the maximum benefit out of the patrol service. Membership drive normally begins in August and runs through the end of October. We recommend members join or renew at the earliest possible time during the drive and as a reminder no matter what day you join or renew your new membership will expire the following year on October 31st. In other words, there is no incentive for members to delay once when you receive the first notice to renew or join. However, waiting to join will cost the organization more money as PHEHA will continue to send notices to renew or join. So, please join early in the process and help us save our money for patrol! As a reminder: No adjustments will be offered if a current resident (residing in PHE for more than 6-9 months) simply forgets to join or renew or chooses to join later in the year. Click here to view information specific to the current membership drive. 5) If I join outside of the annual fall membership drive do I still have to pay the full amount? A: Yes. Regardless of when you join you will be charged the full membership rate. In fairness to our members who pay on time and pay the full amount we do not offer a discount to anyone who pays late. No adjustments will be offered if you join later in the year. As a reminder our treasurer is a volunteer as are all board positions. We request if you are joining later in the year that you simply elect to pay the full annual rate to support the program and help us keep the bookkeeping hours to a minimum. The only exception is for those who are new to our neighborhood. If you are new to the neighborhood (moved into PHE within last 90-120 days) and have moved in outside of our membership drive dates contact us by sending an email to info@PHEHA.org and we will allow you an adjusted rate for the current year. 6) May I pay monthly instead of annually? A: No. We offered monthly payments in the past but no longer offer monthly billing. We do not have the volunteer staff to monitor and organize collection of delinquent monthly accounts. If you would like to volunteer please send an email to info@PHEHA.org. 7) Why don't you offer monthly billing? A: PHEHA experienced abuses by a few members when we tested monthly billing in 2016 so we no longer offer monthly billing as a general policy. However, if you need assistance with payments please contact us and we can discuss this option on a case by case basis. Please send an email to info@PHEHA.org. 8) Why an annual drive and not monthly drives for membership? A: PHEHA signs a contract with the Dallas Police Department each Fall for the following year. We need to know our budget in order to sign the contract. Our budget determines the number of officers and hours we hire for the year. Also, our staff is all made up of all volunteers and we need to all join once a year at the same time to help manage volunteer hours. 9) Do you offer a discounted senior membership? A: No, once the neighborhood reaches a it's goal of fully funding the expanded patrol program we could revisit a senior discount. Discounted memberships limit our budget for patrol hours are counterproductive to achieving our goal. If you are a senior and would like to be a member but need financial assistance contact a board member or send an email to info@PHEHA.org. 10) What is a bundled membership? A: A bundled membership should be used to add a spouse or other household member to your membership so that our email and other communications can reach multiple adults in a household. 11) How can I volunteer or help recruit other neighbors to join? A: Log into the members only section and view the interactive map. We encourage you to contact homes near you, maybe on your block that are not current members. You can download information including information about expanded patrol and an easy to return invoice from our website. Take these items with you to show the neighbor and leave the material behind for them to easily reference and join. We encourage you to knock on doors and help support our neighborhood expanded patrol program! We need your help in growing our membership to increase our fundraising. Want to do more? Send an email to info@PHEHA.org and someone will be in touch! 12) What is the best way to get neighborhood information directly from PHEHA? A: Sign up for our email alerts. Only those in our database will receive our official emails. Please make sure you have a fully completed profile and know your member log-in credentials. Member log-in credentials provide member access to valuable information only accessible through member log-in at PHEHA.org. You can add two email addresses per household membership, simply use the bundle feature. 13) Is PHEHA on social media platforms? A: PHEHA does have Facebook, Instagram and Twitter feeds - like us, follow us, tweet us! We use social feeds to post fun happenings in the neighborhood and promote upcoming events. NOTE: PHEHA is not active on Nextdoor and is in no way affiliated with the Nextdoor platform and/or the Nextdoor "leadership". PHEHA does not post neighborhood crime information on any social platform. Crime updates will only be sent through our official PHEHA emails to our members. PHEHA official business and correspondence can also be found posted in an area on our members only section of our website requiring a login. 14) When is the annual meeting? A: Our annual meeting will be held at Preston Hollow Park under the pavilion on the first Tuesday in October. Look for an email and check our website for updates and the time of the annual meeting. 15) Is PHEHA hosting events like National Night Out (NNO) at Preston Hollow Park again? A: Yes, PHEHA combines the annual PHEHA meeting and National Night Out at our in October (the first Tuesday in October). Look for an email and check our website for updates including the schedule for NNO. 16) Will PHEHA be mailing out a Newsletter via USPS? A: No, we will only be sending seasonal updates via email. Email alerts are the best way to receive messages from PHEHA. Annual renewal invoices for membership dues will continue to be mailed & emailed at the beginning of August. You can help us save money by joining/renewing early in the membership drive saving printing and postage for subsequent USPS reminder mailings. 17) Why isn't the patrol contact information on our yard sign or accessible on the website without the need to log-in? A: PHEHA only allows paid members to access the patrol contact information. Patrol has access to our paid members and will verify membership when contacted. 18) Will any refunds or rebates be given if we move? A: No, rebates or refunds will not be provided for any reason as we commit to our contract with the city based on each membership paid in full. 19) If my membership lapses or I do not renew my household PHEHA membership PHEHA may remove the yard sign from my home? A: Yes, PHEHA allows members the right to display the PHEHA yard sign only if their household membership is current. Each year a new annual decal will be mailed to each household to update their sign. DPD Police rely on the sign and updated annual decal when responding to emergency calls and suspicious activity to be able to quickly identify paid member homes. 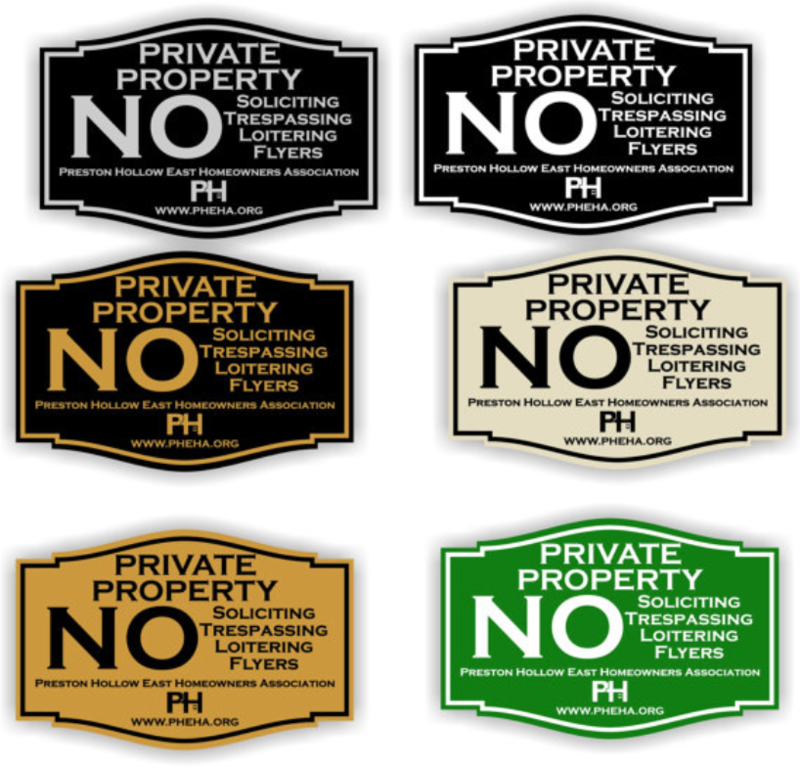 PHEHA Yard signs are included with membership dues and delivered with a small paid handling fee for delivery of $15-20. 20) Is there an increase in annual dues this year? A: No. Funding PHEHA funds our community patrol that adds a protective layer and is a proven criminal deterrent that our neighborhood volunteers organize and our members fund. PHEHA made the decision not to increase annual memberships this year. Our PHEHA Expanded Patrol will only work when we all chip in and we all need to chip in to increase our patrol hours. An increase in household membership will strengthen our program and increase our patrol hours. If you abandon the program our community will lose patrol hours. Renewals are critical to our program as are new memberships. 21) I have an alarm system, cameras and pay taxes for police... why should I also contribute to PHEHA? A: PHEHA organizes expanded police patrols for our community. Each household that joins contributes directly to the number of hours of patrol. A police presence in our community deters crime at the community level. Supporting expanded patrol reduces crime and makes for a safer neighborhood. The average home contributes 12-15 hours of patrol to our program of the 8,760 hours in a year. It is important to keep in mind that there is a police officer shortage in our city and this problem has not improved over many years and there is no cure in sight. When your alarm does go off who is going to be there to help and how long will it take for help to arrive? Alarm calls and 911 calls routinely can take over an hour for a DPD response. PHEHA DPD officers are within 90 seconds of any address in our neighborhood when on duty. The number of hours we can fund is fully dependent on voluntary funds raised through this program. Also, all members get valuable vacation protection. Going on vacation? Let patrol know and our armed DPD officers will visit your property when they are on duty and remove any indication you are away (flyers, newspapers, piled up mail, etc...). Securing your own home at the household level with an alarm system and cameras is a good idea! Locking your car doors and securing your property is a responsibility and if we all are diligent about this criminals will no longer see our neighborhood as an easy mark. Remember, contribute hours of patrol for a community layer of police protection and secure your own property at the household level. Do both! 22) I am not getting emails from PHEHA? A: Please make sure you have a fully completed profile and know your member log-in credentials. Member log-in credentials provide member access to valuable information only accessible through member log-in at PHEHA.org. You can add two email addresses per household membership, simply use the bundle feature. If you are still having trouble contact info@PHEHA.org for help. 23) When will my membership items (yard sign, decal, cabinet sticker, etc...) be mailed? A: Please be patient as PHEHA is made up of neighbors who volunteer and we have limited volunteer support. Membership materials are fulfilled by a third party and can not be dropped off at your home by a volunteer. When you join during the annual membership drive you should receive your membership items within 6-8 weeks after the last day of the drive which ends Oct 31st. . If you join late (after the annual membership drive/after Oct 31st) please allow up to 8 weeks for your materials to arrive. If you have not received your materials kindly let us know by sending an email to info@PHEHA.org. 24) Where can I buy a NO SOLICITING sign?